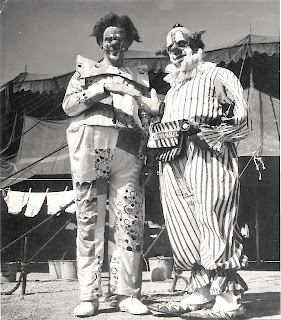 Harry Ritter and what looks to be Frank Cromwell in a photo taken on Ringling somewhere between 1947 and 1960. I make that guess because the person who looks to be Frank Cromwell is dressed like Clarabell from the Howdy Doody show. I would have to guess that this was some kind of cross-promotion between the two shows. 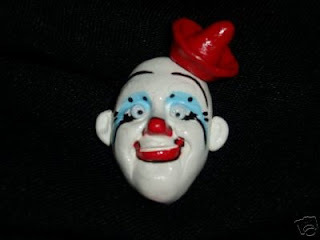 Clarabell's wearing a box around his waist telling us that he would prefer to be called "Dorabell" and he's got Clarabell's face painted on his shoes. Isn't that just a dorabell? My favorite part of the photo is the washline of BVDs in the background. Clean underwear always says "classy". Clown College Dean and former road clown Bill Ballantine with Bobby Kay in a photo that looks to be taken at the Venice Winter Quarters in (judging from Bobby's Amazing Technicolor Dream Robe) the late 60s/early 70s. 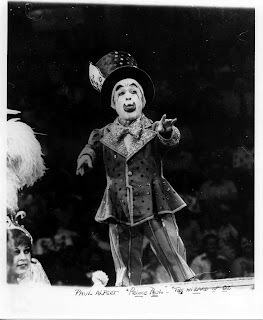 Jerry Adams in an undated photo from the Sells-Floto Circus. Frankie Saluto and two unidentified partners. 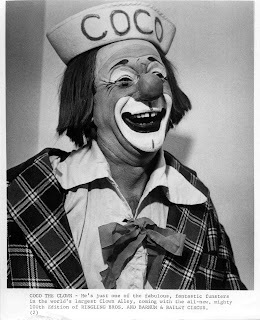 Ernie "Blinko" Burch, ever the picture perfect picture clown. Frankie Saluto and someone (judging from the suit I'd guess Billy Ward or Paul Wenzel) wearing a Paul Jung creation. 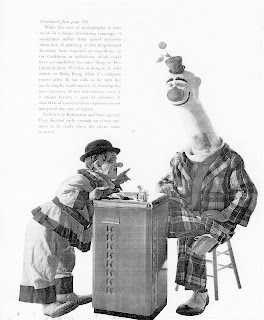 Several photos from an ad or an article that seems to have run in water cooler trade magazine. And last, but certainly not least, take a moment today to remember Duane Lawrence "Uncle Soapy" Thorpe who may have left this world 11 years ago today but will always be a part of The Alley. Rest well Dear Friend... and Thanks for the memories. 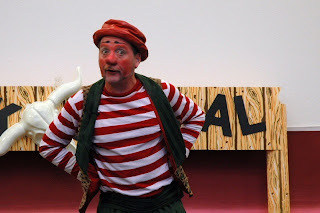 For those in the Sarasota/Bradenton area - Do yourselves a favor and catch the best circus Advance Clown working today when he hits your town on Saturday! Bring a camera! Bring the kids! Bring a camcorder! This will be one to remember! 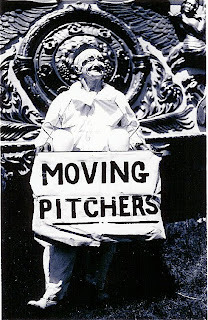 And if you're a circus PRODUCER...well, he's STILL unsigned for next year so feel free to bring along a contract and talk with Mr. Gern about the 2007 season. 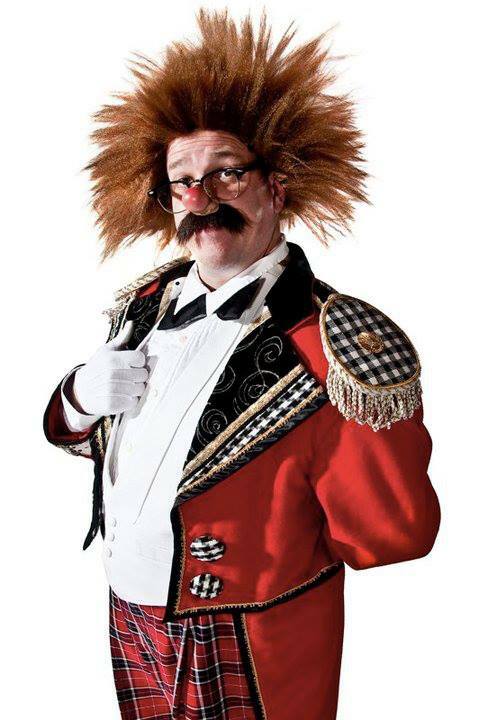 SARASOTA - Bonzo Crunch, a clown from Ringling Bros. and Barnum & Bailey Circus, will perform at G.Wiz, The Hands-On Science Museum. Crunch is scheduled at 1 p.m and 2 p.m.. Saturday at the museum, 1001 Blvd. of the Arts, Sarasota, according to a museum press release. 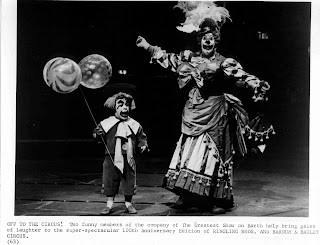 "This is the first time for G.WIZ and its visitors, and it's been 50 years since Ringling Bros. has rolled into town," Lansky said. 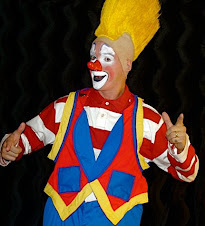 The clown act is appropriate for the museum because Ringling Bros. acts allow visitors to see many of the laws and principles of physics brought to life, the press release stated. 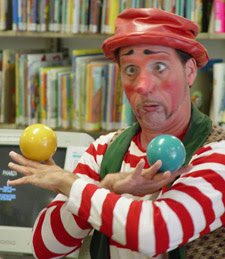 Before and after the performances, Bonzo Crunch will play with G. WIZ visitors, teaching them how to juggle and make their own juggling bags, Lansky said. Cost for the show is $9 for adults, $8 for seniors age 65 and older and $6 for children age three to 18. Children younger than three attend free as do G-WIZ members. 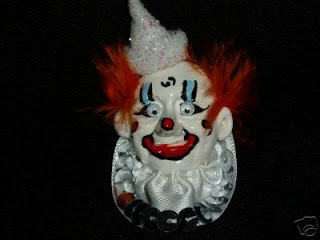 The past work of one of the great clowns of the present, The Bindlestiff Family Cirkus' Keith "Mr. Pennygaff" Nelson. Keith, Stephanie and the Bindlestiff crew never fail to amuse and amaze. And they rock a mean seder! 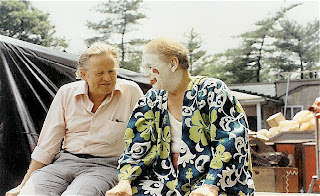 The last of the series of Harold Ronk Estate photos that I received from Robin Estes. 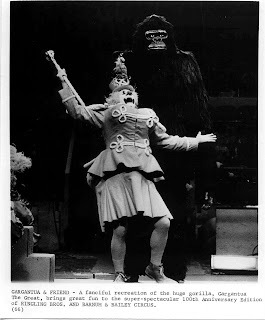 Here's Duane "Uncle Soapy" Thorpe, a much-loved member of the Ringling Clown Alley for almost 40 years, in 1970 production number wardrobe being escorted by "Gargantua". 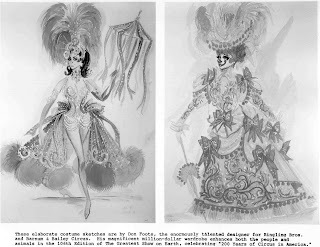 Don Foote's design for Soapy's spec wardrobe for the 1970 100th edition Ringling Blue Unit show. Soap out workin' it on the floor with the help of Prince Paul. 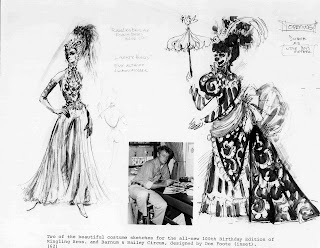 A Don Foote design for Soapy's spec wardrobe for the 106th, proving that fashion's fickle fads may have and come and gone quickly in the 60s and 70s but Soapy's Victorian taste in drag remained the ever the same. 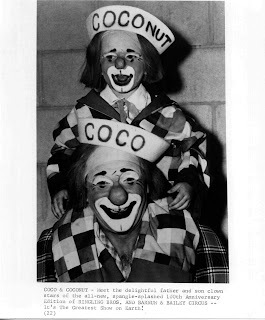 Coco the Clown with Coconut. 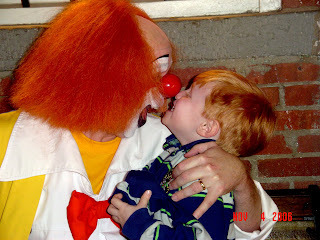 Me with the funniest kid I know, my son Shane "Buddy Boy" Cashin who is celebrating his fourth birthday today. When asked what our friends should name their baby, without hesitation Shane immediately replied, "Coupon!" When asked for a name for another couple's baby he came up with "Fried Baby Head". He's got a very "Zappa-esque" sense of humor for a four year old. This morning he had breakfast with Daddy and Dean "Elmo Gibb" Chambers, who he remembered from this past summer as "That funny guy who bonked me in the head with a giant hammer". 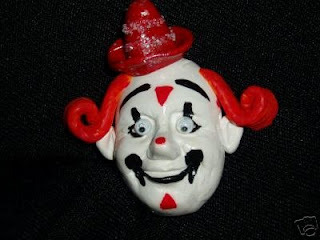 In makeup or not, I can't think of a better clown to have around for your birthday. Some people call him "The Space Cowboy". Some call him "The Gangster of Love". But we know him as Prince Paul, and he's crunkin' out the kinda old school moves that make ALL the fly ladies lose they minds in this photo from the 106th edition Ringling Blue Unit. Mad skills. Mad, mad skills. 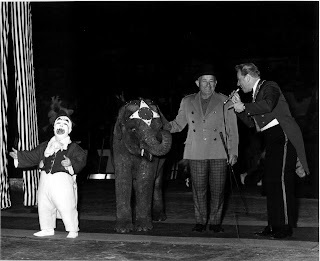 An undated photo that looks to be from the late 60s with Prince Paul, an elephant (possibly the same Baby John from the other day) an unidentified fella and Ringmaster Harold Ronk. 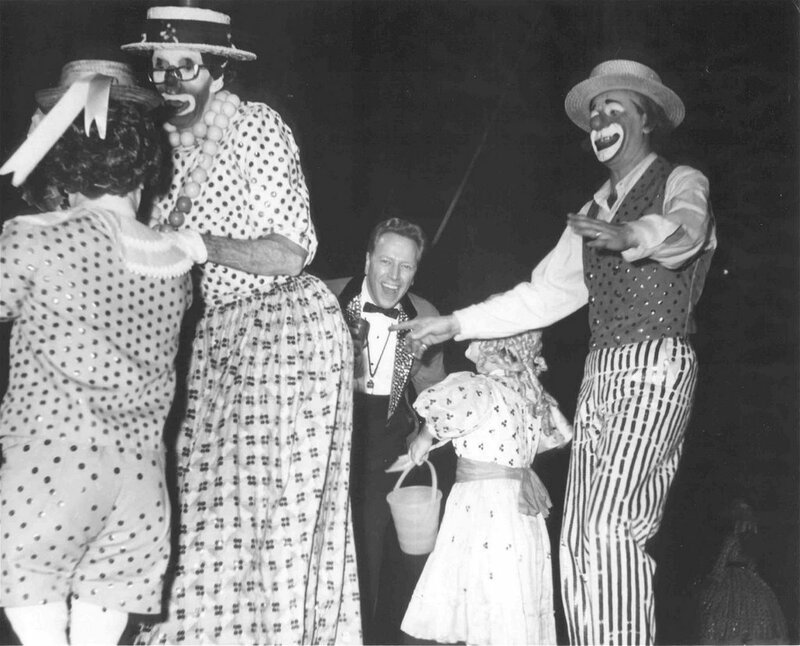 The legs of that stiltwalker on the left may be those of Mike Coco, maybe Barry Sloan. Half Wizard of Oz, half Mad Hatter - all Prince! "My definition of wit is what comes off the top of the head (or off the wall), whichever you prefer. 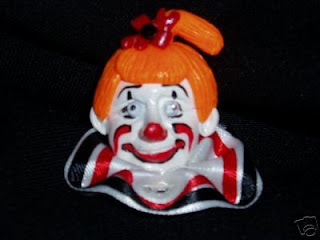 I love Greg's remark,"more bells than you can shake a clown at". That's funny! 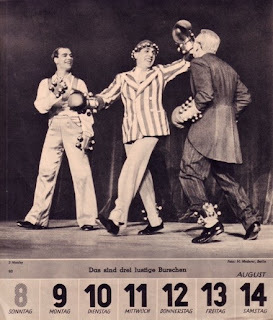 The attached picture is from a 1943 International Artists Calendar, of The Three Manlys, my limited knowledge of written German tells me they were brothers, and came from Copenhagen." Thanks again, Bill! 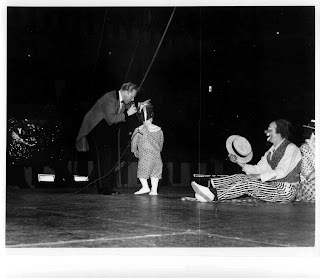 Click the title of this post to link to Bill's circus blog, YESTERDAY'S TOWNS. 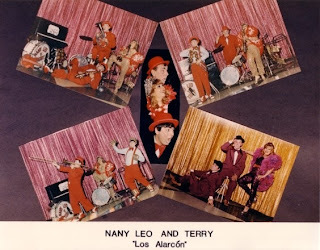 The name came up the other day so here's a photo of musical comedy act, Los Alarcons. 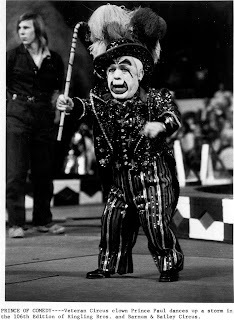 Mike Coco in a publicity photo for the 1970 100th edition of the Ringling Bros. and Barnum & Bailey Circus. The "blurb" has been left on the picture. What's the consensus? Do we want to see the blurbs or do we prefer that I continue to crop them? 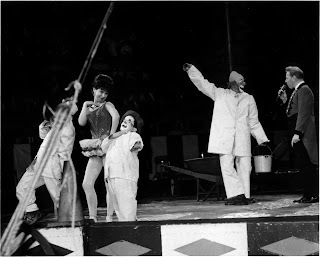 Mike Coco, Ringmaster Harold Ronk, Prince Paul Albert (back to the camera) and Albert White (seated with his back to Mike) in a gag that also included Gene Lewis. What that gag was, I don't know. Possibly a picnic? It must have been done prior to 1966. Click the title of this post to link to the earlier photo. 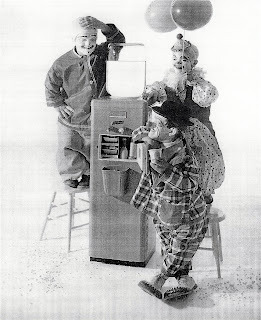 A photo from Coco' s 1960s classic soap gag COCO'S CRAZY COLORISTS. We've already seen a few pictures from this gag, click the title of this post to link to the earlier photos. Notice Mike's rubber topped gag wig. What is that, a 'reservoir tip" on the top??? 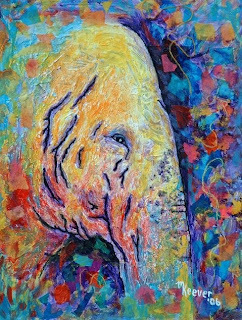 Click the title of this post to link to the Cel-ebration Art Gallery in Red Bank, NJ and learn more about Mike and his artwork. 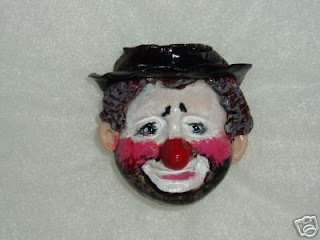 Click the title of this post to link to Karen's eBay store. Bid early and often! 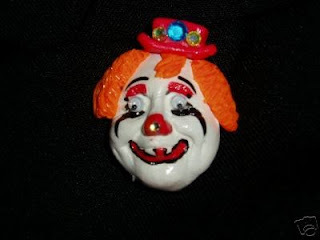 Karen graduated from the Ringling Clown College in 1993 and then was featured in Ringling's Blue Unit. 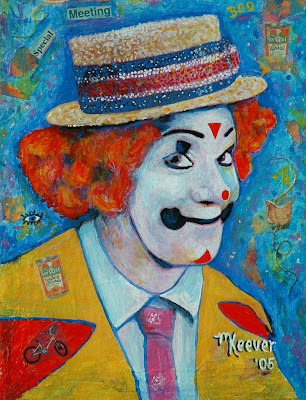 A member of the Clown Care (SM) hospital clowning program of the Big Apple Circus, Karen is one of the country's leading clown instructors and has developed teaching programs for the Circus's Arts-In-Education program, the National Circus Project and Ocean Park Amusements. 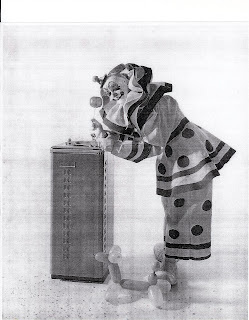 As a businesswoman, she created and ran a successful clown and character production company in California. Her performances have taken her to the stages of Carnegie Hall, the State Capital of California and the Macy's Thanksgiving Day Parade. 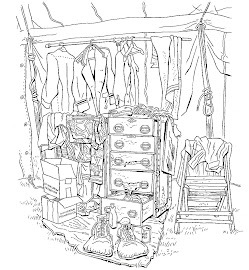 Karen is also a published author with articles in the Rosie magazine and the children's book, Star Saves the Circus. 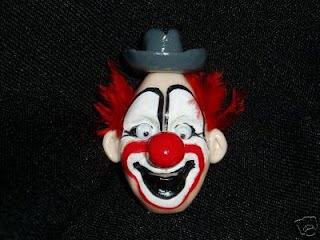 Click the title of this post to link to Karen's eBay store. The artist herself, along with her husband Greg, peforming with the Big Apple Circus' GRANDMA GOES TO HOLLYWOOD tour in 2005/06.